Any female would relate when I say one of my daily struggles is stopping myself from online shopping. Although I can proudly say I have some restraint, sometimes all the gorgeous pictures of the available items at just the click of a button get too much and I make a good dent in my bank account. I am saving hard to get to Europe though so am going to start a new thing on my blog where I debate to "Spend OR Save". I will compare an item I have my online shopping eyes on, & then find a similar item at a fraction of the cost. Today's Spend or Save is my weakness - High Heels! These gorgeous black heels are $249 & are Peep Toe. 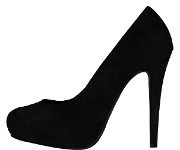 And these gorgeous black heels are $69 from Fiebieger. After purchasing 3 other pairs of heels this week, I have voted, and gone with the $69 Fiebieger's. 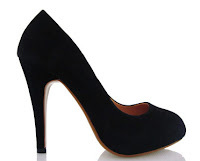 I'm still going to be getting my perfect 12cm heeled, suede shoes - for $180 less.